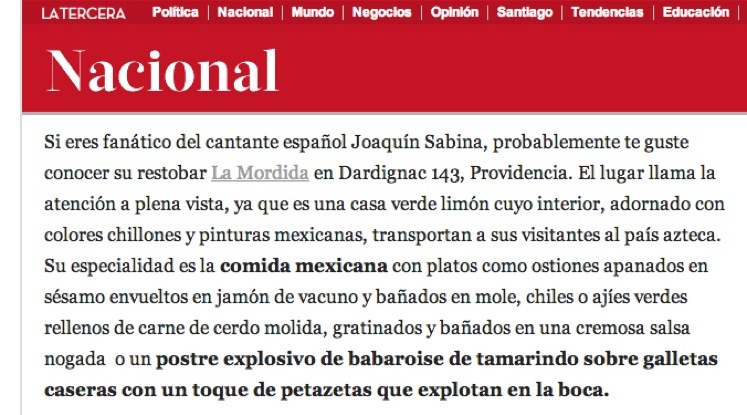 If you are a fan of the Spanish singer Joaquín Sabina, you will probably know about his restaurant La Mordida in Dardignac 143, Providencia city. This place is very picturesque, because it’s a green house with an inside decoration of gaudy colors and Mexican paintings. This look takes the visitors to an Aztec environment they will never forget. The speciality of the restaurant is the Mexican food with dishes like big oysters with sesame wrapped in jam and guacamole. Also, spicy peppers stuffed with pork meat and a special sauce gratin. But their most innovative dessert is an explosive Bavarian cream made with tamarind and cookies sprinkled with Peta Zetas® popping candy, an explosive surprise for the mouth.